Background checks and new hires? Every employer has an obligation to prevent negligent hiring, to reduce the risk of data breaches, and to ensure workplace safety. 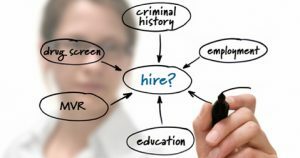 So what do you do when your new hire fails their background check? Do you rescind the job offer? Verify the background check records actually belong to the candidate. Inaccurate data entry or database inconsistencies can easily happen during the application process. Data entry errors are common if the data is entered incorrectly. Database records can easily be outdated or incomplete. Make sure your background screening company performs a quality inspection of the record to ensure its accuracy. Your background check policy and decision matrix are helpful for consistent hiring practices. Your background screening policy should provide specific guidance for vetting potential candidates for certain positions within your company. A decision matrix is a reference tool to review when a background screening reveals a criminal record, it should provide specific guidance about what do when a candidate fails a particular screening. Both the decision matrix and the background check policy should be reviewed and updated regularly according to your companies hiring practices and current regulations both state and federal. Before you decide to rescind a job offer, the job candidate must be given an opportunity to explain and / or dispute the accuracy of the background check results. The Fair Credit Reporting Act states that a candidate must be notified with a Pre-Adverse Action notice. The Pre-Adverse Action notice informs the individual the job offer may be rescinded based on the information found in their background report. They should also receive a copy of their background report, a copy of their rights under the FCRA and a reasonable period of time to dispute the results. After the candidate receives their pre-adverse action notice, the employer must allow a reasonable amount of time for them to review the results of their background check. If your new hire is able to properly explain and/or dispute the results, and their record is updated and removed, they are approved and can move forward in the hiring process. If they cannot explain, or do not dispute the results, the next step is to send an Adverse Action notice. An employer can only take adverse action after providing the candidate with a pre-adverse action notice. The adverse action notice must be in writing and state that the job offer is retracted due to failing the background check and that the results were not disputed. The candidate must also be provided with a copy of the report and the background check company used to run the report. Making the decision to hire or not hire should be a multi-step process to ensure the candidate’s rights are protected. With rise in FCRA claims more companies are being subjected to legislation for not practicing correct hiring procedures.